NPC Xpress is a web based Web-to-Print (W2P) solution that enables buyers to select items they wish to purchase from a pre-defined list – they are able to view pricing, determine the quantity and specifications and pay with a credit card. A broad range of unlimited template items such as corporate stationery, business cards, brochures and newsletters are offered while at the same time more complex items, such as direct mail components and marketing collateral are also supported. Ordering, typesetting, proofing, workflow and fulfillment are all managed from the desktop, anywhere in the world. 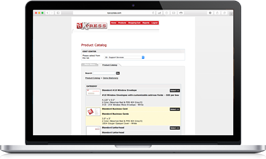 By giving our customers direct desktop control, NPC Xpress creates a more efficient and cost-effective purchasing system. NPC Xpress maintains each client’s graphic standards, generates instant online proofs and provides multi-location organizations with the flexibility and convenience of Internet-based, remote ordering capability.